Mint is one of those herbs which is very easily available in India and so very popular and chutney is my favorite preparation to make. We all make all kinds of chutneys , rice , paratha and drinks. This is one of my favorite. 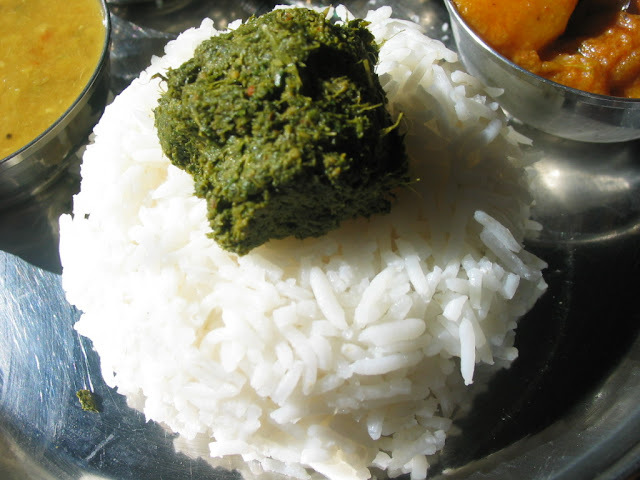 I just love to serve it with warm rice and ghee . Goes well with crackers and chips too. Mix a tbsp of chutney with 1/4 cup yogurt and you have a wonderful dip. Heat oil in a pan and urad dal and let it turn golden. Add coconut , green chilli and tamarind and cook for a minute. Add the mint leaves and switch of the flame and let the leaves wilt a little. mint chutney looks tempting ...love the tempting lunch platter ...wow what a visual treat it is !! Yummy chutney..nice clicks..Do visit me when you find time dear..
Wow..its simply superb..this is my fav chutney..
My favourite chutney, very tempting..
My all time fav chutney nisha..i too have one in my draft..ur looks delicious! Love that whole platter.. First time here.. You have a great space.. Discovered you via Denufood - my god, you're all making me so hungry! I'm missing Indian food dreadfully as we've been on the road so long. I'd love to encourage you to enter our food blogging contest - you simply have to post about a quintessential dish of a place. See here for details: http://bit.ly/cKqzv0 Deadline in a few days! Wow..a very very tempting platter..mint chutney looks fab! pass me that platter i can finish off within seconds...drool..drool!! A delicious chutney and love the lunch platter.